It might not be easy to talk about divorce and an end of a relationship in general, but the truth is that divorce is as much present in today’s life as marriage. One might say that there’s a balance, a yin yang when it comes to the world’s love as well. 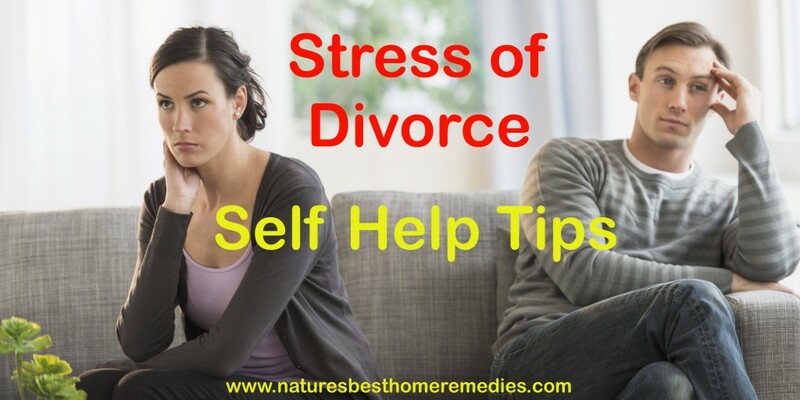 Dealing with divorce is by no means something that can be done instantly and there isn’t a sure and proven way that would provide almost effortless recovery, but there are ways to speed up the healing process or make things just a little bit easier when one is trying to reduce stress after the failed marriage. Most people are afraid of showing their true emotions and succumbing to the sadness. Actually, keeping the feelings bottled up can raise the stress levels even more than the sadness itself. People are not machines and as much as someone is tough no one is immune to the matters of the heart. Therefore, you have to let the stress pass through your body and mind and let it spill out gradually by allowing yourself to be sad as much as you need. This too is a road to recovery. By being sad, one also comes to the point of accepting the situation as it is, which is of great importance for getting over the broken heart. After the divorce, try to lead yournormal daily life. This means that whatever you did before the divorce shouldn’t change now. Actually, your job, hobbies and regular chores can keep your mind clear. While it is true that you should allow yourself a period to heal you shouldn’t pause your life and spend all your time doing nothing except thinking about the divorce. When there’s nothing to do and occupy the thoughts, focus on the failed marriage can get out of hand which would only lead to more stress. You’re definitely not alone and even if your former partner is not involved in your life anymore, there are other people whom you mean the world to and would give anything to see you smile. Therefore, do not shut yourself away from others, but let them be there for you. If you don’t want to talk about the divorce, don’t be afraid to tell them so. By being together with your friends and family, having a good talk or laugh, you will realize that the world hasn’t stopped and their presence and friendship will reduce the amount of stress. If you exercised before the divorce keep doing so. If not, take up some light exercises for starters. Exercising in general releases the toxins from the body and makes you more energized and happier. What’s more, your fit figure is definitely going to improve your self-confidence. Physical activity is one of the main stress-relieving strategies. When you’re finally filing for divorce in Oregon be aware that this too is something your mind urged you to do for yourself. If you could go through something like that and arrive to such a final conclusion you can also do something far more interesting and enjoyable for yourself. Do something that you’ve always wanted to do. It can be travelling, changing up the fashion style, taking up a new hobby and even going out more. Whatever was the object of your desires for a long time, make it happen now. Breaking the chains that bound you is now something that you can achieve. Once the divorce is in motion, skip the blaming part entirely, even if there is someone to blame. You won’t benefit from clinging to the past and stress accumulated due to constant questioning of what actually happened can only put you down and depressed. If you fail to cope with divorce stress, coping with depression will be your next battle so its wise to accept and let it go. Tracey Clayton is a full time mom of three girls. She feels she knows a thing or two about raising happy, healthy and confident kids, and offers helpful advices in hers parenting articles. Her motto is: “Live the life you love, love the life you live.